← 5 people myths we need to blow…. Integrity, credibility and creativity seem to be the missing elements of current and proposed representative bodies. Will someone please step forward and lead the better parts of this industry to the promised land. A witty expose – thanks! I sometimes wonder where you find the time but I’m glad you do! 😉 Great expose although from looking at the details – including the shiny suits – I’m sure it wont need many blogs like this to weed out the truth! I’m practically wetting myself and kicking myself at the same time on the basis that i may have missed an opportunity to bring a “technical offering that is “probably the most radical the industry will ever see.” I have been this market and playing with tech for a long time – the thought that there is such a thing is too much to bear. Cant wait for the big reveal. You are clearly not that good then by your own admition. You can do anything of note so nobody else can, hmmmm, I think not. Lol. Fetch the suitcase from the van. Then recruiter I’m your man! Or the tides of the sea. Clearly the REC is fo you my friend, you were made for each other, lol. Alconcalcia you are a gem! I wonder why the CIPD haven’t cornered the market? Actually, such an organisation if it was fit for purpose and supported by its members could make a big difference through standards, ethics and accreditation. Couldn’t it? The most revolutionary thing that can happen to the recruitment industry is to be forced to always specify the client on the advert. Then candidates can choose to use the most excellent and value-adding recruiter (not) or go direct to the company. WHY don’t all HRDs demand that the company name is clearly outlined except for clandestine searches? …and then pay thousands to the recruiter to be given few CVs for people who would approach them directly if they saw an ad? Durrh – recruiters don’t own the candidates -geddit?? Good points raised in your piece. Certainly I did think that the guy who ran the digital agency and was involved was a little strange but always willing to give people the benefit of the doubt. 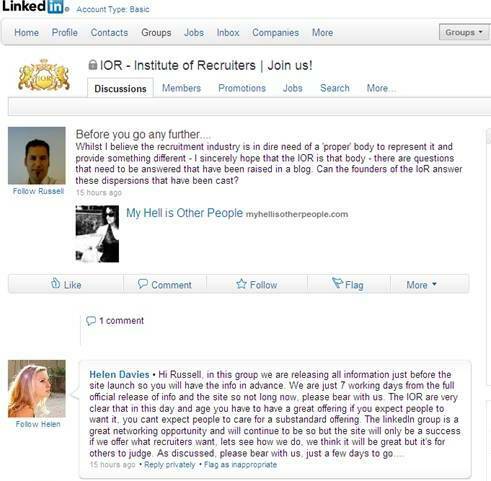 I’ve posted, in their IoR Group on their (moderated) discussion page on Linkedin with a link to your blog. I hope it appears soon. I’m sure they’ll dismiss the dispersions you cast and will go on to build something the recruitment industry is in desperate need of – an industry body with balls and not another group of busybodies or chancers setting up an ‘Institute’ looking to make a fast buck. I look forward to their response to your blog, as I’m sure others will too. With the power of the web how do these two think their true “skills” won’t be uncovered. Roll on the ASA regulation of websites! What goes around comes around! From what I see they have done nothing wrong Sarah, check your facts, not what clueless people write, dont follw like a sheep, check it out first for yourself. So they have posting the most ridiculous generic reply on their LinkedIn group that doesn’t address any of the issues raised and basically just says wait and see what we do in 7 days time. I have posted a reply suggesting that ignoring the blog conversations is going to do nothing to build their credibility but of course my comment has gone to be moderated, they have also got a Twitter account that is just tweeting quotes. This has EPIC FAIL written all over it! In your opinion ‘for what is worth’! I think, looking at that reply, that they are just an automated bot! That can be the only explanation for the generic and bland responses. It also intrigued (Can’t think of a better word) me why they were using stock model photos for their “Helpdesk” people! Not sure if it will be an Epic Fail Matt as I don’t honestly believe they are genuine, but they are up to something suspicious! I am happy to declare I know one of the newly appointed IoR Regional Directors personally and she is really happy to be involved. I can get answers if you want and post here, as long as the questions are decent!!!! They are very reputable. I know the agency who is supplying the off site staff who support the linkedin group and its a separate company altogether on a contract. I know they have an amazing chairman. I now its a real institute. I know they have a fantastic IoR head of education as my partner got her IoR briefing pack today as all RDs did. I am not mentioning her name as you are posting unkind things on here so I have declared my interest so thats pretty fair I think. I also know its international and I know they are planning launches in 5 countries including a main office in Brussels with people on serious committees that make EU law! I know they are charging less than the REC. I Know they have technology that state of the art. I know they have very smart people involved. I know incumbents are worries, I mean really worried. Apparently, the REC are having board level meetings about it and consider the IoR the first and only credible threat they have had in years. I know Steve Huxham is not best pleased and will do anything to stop them (read his posts), I mean anything. I know they are the real deal. Its a first and hard to believe I know, but my god, this will change things. is she the one in the pic? The ex Italian model? SC – it really doesn’t matter how ‘great’ the technology is, how ‘cheap’ their rates are, how many boards they sit on and how many countries they are in. the point is that they are a ‘representative’ body. The point of a ‘representative’ body? to represent their members! Ten out of ten! However, as i can only judge them on how they have represented themselves so I can tell you that they have done a pretty crap job of doing that so far. If i was a legitimate recruiter, I wouldn’t want them representing me in that way. But hang on….. no wait…! Of course!! Lack of communication, mis-information, false pretences, bigging up their part? Sounds like…. Your comment – whoever you are – typifies the whole charade. You are simply defending the whole miss-information piece with the words “I KNOW”! You might well be the most credible person in the world (but you leave no name so we cant tell, can we?) to be making these comments. But by just saying ” I know this” and “I know that” with no substance or fact to actually back it up, just adds to the whole IoR farce that is self imploding before it even starts. REC scared by this charade – dont make me laugh, they have more to fear from Thomas theTank Engine!! The word ‘Society’ is also a protected word at companies house. Does the Recruitment Society have permission to use this word and can that be demonstrated – Steve Huxham, please advise? I ask as you can not use the word ‘Society’ even for a day without permission and if you look at companies house it is not registered to Steve Huxham. Also, what is the legal entity of the Recruitment Society? There is no reference at companies house or on the website whatever, can anyone confirm? Just for the record, i was asked to be the Head Of education. I have both the contract and e-mail correspondence to demonstrate this. I was told steve Huxham was a part of the commitee. Seems not. I stated at the time, as I always have: “love them or hate them. Work on the industry body you have, and not a new one. 3 industry bodies (only 2 of which are creditable, are more than enough!) ” I know The Recruitment Guru of old, given his first recruitment employer. if this pantomime continues, i will be glad to publish a few truths and e-mails in a blog post. it is really your call. Bill, what qualifications do you have? Trainingand experience are not qualifications. Have you got a degree, masters, anything? As its a professional body and promoting qualifications at degree level an academic needs to do that, hence the barrister. You linkedin profile suggests you have no qualifications whatever. If the IOR head of education had no major academic qualifications that would be insanity. Bill, do you think your threat of posting some emails will mean anthing to the IOR and stop them? Who cares what you do Bill? Nobody! Um, “Recruiter”… do you know who Bill Boorman is? If you don’t, then I suspect you don’t actually work in the recruitment industry. He’s a pretty influential guy, both here in the UK and overseas, so I imagine quite a lot of people care about he thinks. Both Dave (who i trained several times as a consultant), ans Azmet were very keen for me to set up the training for the newly formed body and sign up as an advisor running the education/training side. Perhaps, dave or Azmet might like to come out and deny or acknowledge this. Could be Recruiter is a little missinformed. BTW: You don’t need a degree to be accredited to deliver/manage qualifications. you need proof of competence and certification with an examinations body. I have both. but then who listens to what I say anyway? This is just a quick post to set the record straight regarding Bill Boorman, not on here to start a war, I respect all your opinions and want to try and open up a line of communication in the future ASAP. While I don’t agree with Bill that this new organisation is a ‘pantomime’, it is credible and will do a great job I am sure, I have to jump in and correct ‘Recruiter’. I respect your passion for the IOR ‘Recruiter’ and what we want to achieve, but open dialogue and using a real name is best, it adds credibility to what you say. I can confirm, Bill is 100% correct in what he is saying. I spoke to Bill about several IOR aspects including education as we respect Bill as an industry heavyweight in his field. His background and success commands respect, which is a fact. I would urge anyone ‘representing’ the IOR to post respectfully and with your real names. People on these boards are respected industry people, they are entitled to comment and criticise how they see fit, and their years in the industry and knowledge affords them that right. Quite simply brilliant! Wouldn’t have had you pegged as a champion of the people but most definately you are my hero for the day. Wonderful blog. Thank you. SC – I KNOW that at least two of this shower own R2R businesses. Not IT or Finance or construction recruitment but a body shop of the types of members they are encouraging. Highly useful I would suggest? Your partner is probably very genuine and you sound it too, but you are both being duped. Kick these scammers in to touch. Seems like you hav made up your minds, that is your choice and people should respect that. My opinion is different. Gareth is right on one point though, as the IOR is a professional body most people may not understand what that means so for them a trade body like the REC is best. As for the REC not being worried, I can only assume you ar talking without knowledge as if you did know you would not post that. I am stating a fact with knowlede of a person working there, you posted that just for the sake of posting it, thats where we differ, check your facts for a change. Andy, you mention two own a R2R, do you just post anything? Is there any factual part of your posts> One is a technologies and one owns an R2R, one is a Barrister, one is the ex group chairman of one of the top 10 plc IT recruitment firms in the UK, you post nonsense, what do you read, beano? I would seggest all readers ignore Andy, he is clueless and posts whats in his head, which is mostly fiction. SC – I believe that Mike Waterton, Regional something or other also owns a R2R. Thanks for the insults. Andy, firstly I apologise for being insulting, you are right to take me to task, I just got pi??? ?ed off, it won’t happen again. Have looked at your site, seems like a good site, good information. You may be right about Mike, I dont know him to be honest, if he is R2R he wont be ‘naughty’ as IOR Regional Directors dont have any access to the IOR membership database. I never meant to be so passionate in my post, I just want to see what they do that is all. All this stuff about profile pics is not a bog deal, it was not even the IOR, that is why I got angry as you were missing that crucial point, the linkedin group staff are from another company so to me that is put to bed. Here is something interesting though Mike, it’s being reported more and more, have you read that people are complaining that the IOR removed them from the group? Its not by accident! The group has strict rules, to discuss geneal recruitment matters and by setting the rules they avoid good discussions being distracted by issues like profiles pics, so fair enough, I understand why the group rules are in place. But here is the kicker, have you also read that many recruiters (as Gareth correctly ends his piece with) think other recruiters are just unprofessional and dont want anything to do with them right? They think a large number are unprofessional with no clue and just set up as recruitment consultants right? Its a bug bear of recruiters for years. Well, the IOR are (without exception) ejecting anyone from the group and the institute anyone who can’t follow rules, thus leaving within the IOR a group with ethics, ability to follow rules and protocol etc. They only want the professionals. The REC allow you to be a fellow or members depending on what you pay right, so as a professional you get the same letters after your name as a rogue. The IOR does not care for the fees, they will throw you own for any disrespect of rules, and ou can’t buy an IOR membership or fellowship, you have to pass exams set by the IOR education director who is a published barrister! Wow, now you see why the group is growing and why we all like it, finaly we seperate ourselves from the crap! Also, you remember when HAYS were ‘naughty’ and the REC (Recruitement’s Estate agents & Con artists) did nothing as they dont want to lose the fees!!! Well, the IOR would have kicked their rears out, fees or no fees! Now you see what this is about, they dont car how big the company you work for, how much money you have, how long you have been around, how respected you are, cross the line and expect to bebooted out ofr the IOR, no questions asked. Finally, this is what we have been waiting for, I can distance myself (as an IOR member or Fellow) from REC members! YES!!!!!!!! I got removed from the IOR and I haven’t posted there yet! SC – glad you have looked me up and that you like the site. You have me at a disadvantage however as I don’t know who you are. Is there a reason why you are concealing your name? You seem very knowledgeable about the cult but you still lack credibility as Andy Headworth rightly pointed out if you won’t let us check your credentials. Hi Andy, I am not giving my contact details as I am not looking to get into a war with REC supporters, not in this day and age. I accept that you are at a disadvantage, am sorry for that and I hope you can overlook it just this once but I am concerned and dont want ant trouble with anyone. Also, saying the IOR is a cult is not helpful or accurate so I will ignore that. Just so I understand, do you think the REC are value for money? Also, taking what I have said as knowledge RDs are getting, does the content of what I have said (forget allegations, all that negative stuff some write for just a second) show you what they are trying to achieve and why people are flocking to the group? Strict rules, comment censorship, unwilling to be open about your identity, denial, tendency to get p***ed off easily, secrecy – wow, where do I sign up? Will you charge as well, cause I’d pay, for sure!! SC – does it not occur to you that because you (and the group) are not sharing some basic facts that it immediately creates doubt, and as such, criticism! Be open and we might warm to you and the group! Hi Rob, I understand the justified frustration, my partner (the RD I am connected to) told me the RDs have just got all the info now, in the last few days so they were fighting fires too. All the questions I have read on the blogs that have angered people have been fully addressed in this information release so hopefully now this will all be in the public dommain by in the next few days. The answers are not ‘sensitive’ in the slightest, the RDs were just told they had a release schedule and were sticking to it as the material was being formally prepared. I also think they got taken aback too, I dont think they expected the group to grow so fast and the demand for answers to come so quick. The RDs info pack is beautifully designed etc so thats nice to see the quality is there. As of today Rob I have not seen a single question on any blog that is not fully answered in this document so thank god for that, all good form here on I hope but I do think they will stick to strict information release dates no matter what. Finally we get there!! You anger is understood Rob, I agree with you that it’s justified also and will be relayed back for sure. p.s. Andy Headworth’s blog and social media services are really good and would be a real asset to recruiters to know more about, shame he is not warm to the IOR as I think he and they should do some events together. Andy’s type of service is the future if you ask me, spot on Andy! Am I the only one to be shocked at the abysmal command of written English in this comments section? Whoever “SC” is really needs some refresher lessons in tact, diplomacy, spelling and grammar. I do hope they aren’t representative of the standards at the IOR. These responses are actually a little bit freaky – it’s all a bit cultish for a supposed professional body… (cue the hysterical response from one of the IoR cronies). All they need to do now is threaten to sue you, and anyone else who’s dared to criticise or question them, and there you have it folks – a full blown cult. Bill – I got kicked out without posting anything either. SC – I consider myself to be a highly professional and senior recruiter. I assume the IOR did as well as they asked me to be their Chair due to my experience on the Board of the REC. I turned them down. So far Dave Barber has not had the courtesy to explain to me why he has not answered my emails asking why he has summarily ejected me from the IOR. Neither has he explained why he has sent an email to a colleague of mine stating that this is for “legal reasons” and “to trust him on this” thereby effectively casting doubt on my professional integrity. I am still considering whether it is worth my solicitor becoming involved. A couple of general observations, I didn’t moderate any comments on this post but I came very close. You can have a pop at me all you like, but having a pop at other people making comments is not on. @Azmat – Thanks for commenting and I appreciate your intervention, but my friend you have a problem here. Whether these people are working for or connected to IoR or not, they are a PR disaster waiting to happen. And they reflect badly on your organisation and the recruitment profession as a whole. Fake names, multiple accounts and personal slights are not the way forward. @Mark Wallace you might want to meet @Recruiter you seem to share an IP address….and Alan Shaw…..he wouldn’t be any relation would he? Dumb question… What is my photo doing on this post?? I feel so out of context! !